Why Did I Not Enter Short on Rejection from Resistance? Q. 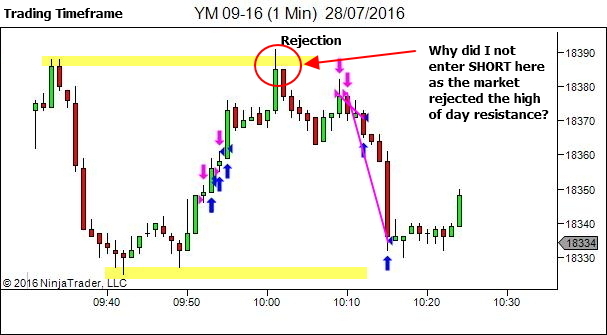 Why did I not enter SHORT on the initial rejection of session high resistance? Why did you not enter at the first rejection? It was a test of the previous high, did you not take it because it was the 1st test? The 2nd test where you entered was also a lower high, and I'm assuming you take the trade late in the candle or at the close when you know it's going to be a lower high? Or does the lower high play no part in your thinking to go short in this case? Did you use a lower timeframe to enter? Or were you gun-shy from the previous attempts and wanted more confirmation, as per your comment "and screams out to be traded"? The trade you identified is absolutely a valid trade. In fact, it's an exceptional entry. I would love to have taken it (for ego purposes). The reason I didn't is simply because, having come off a sequence of poor decision making, I was waiting for an opportunity that really had EVERYTHING going for it. And while I REALLY LOVE the initial test of resistance that you identified, it is going against quite a strong bullish price move. There is of course every reason to suggest it's over-extended and offers potential to snap back toward the mean, if not completely reverse. 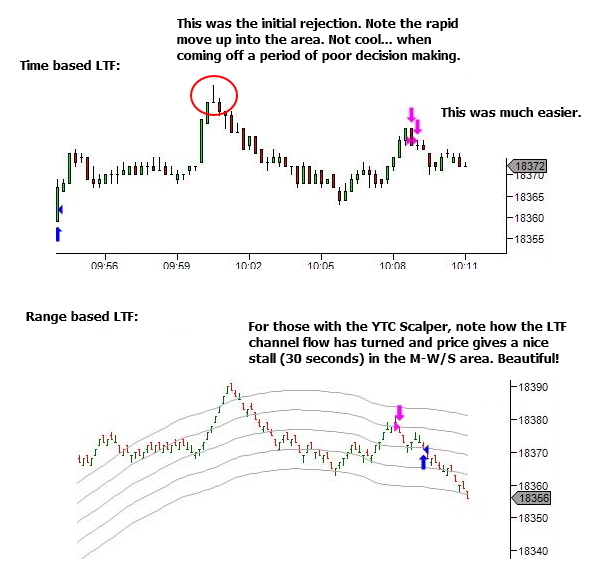 Weakness within the last LTF candle offers a great entry. However, a second-chance (retest) entry is often a better probability option. Plus it's psychologically easier. It has recent price action at it's back to act as resistance to further movement. 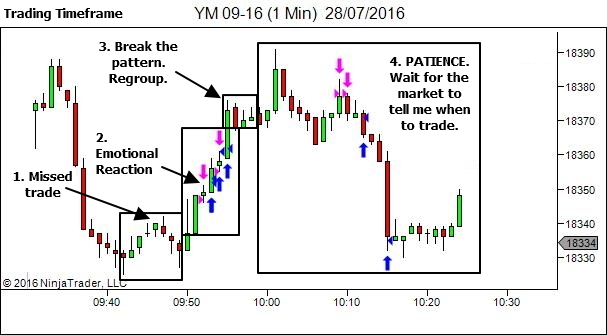 Entry was on the lower timeframes (monitoring both 15 sec and the 2-range charts). But yes, essentially I was waiting for the market to scream out to me that it should be traded. The initial test of the highs was more of a nudge… "Hey you do know there is opportunity here, don't you!". The actual entry on the retest was when it was screaming. This is the one I'd be kicking myself if I stood aside. If you miss one, let it go. There is so much more opportunity coming in the future. You don't have to catch every move. Wait… till it all sets up just how YOU want it.